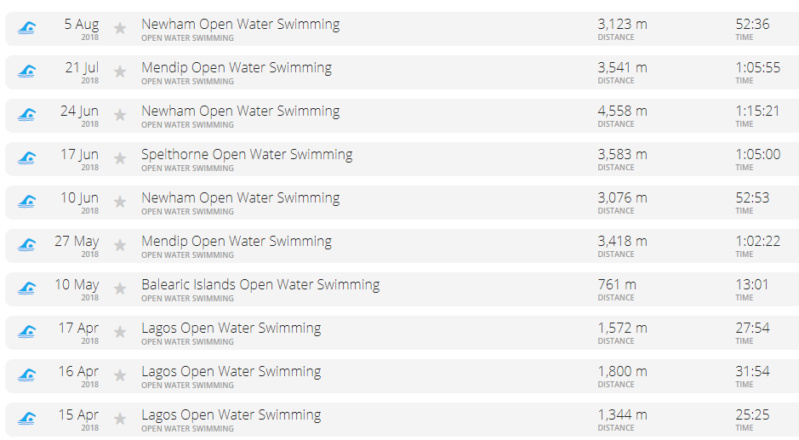 Does anyone else's Garmin round up open water swim distances to the nearest 25m. Mine shows the "correct" distance after I've finished and even the first time I go into the activity to edit the name etc. However, by the next day the distance has changed to a multiple of 25m. Yesterday's swim was 2842m and showing as that on Garmin connect after upload but this morning it's 2850. I only noticed it recently as I don't often go back and look at activities after the first day but looks like it's always done it. It's a Fenix 2 but appears to be happening in Garmin connect rather than on the watch itself. I'm not really bothered either way as that's way less than the level of inaccuracy of the distance in the first place, just curious. If that's the only 'fault' on your Garmin, you're the lucky one! Curiouser and curiouser, the only swims that aren't rounded are 4 sea swims I did on holiday. Haven't changed any settings on watch or Garmin connect so what's so special about those? Not something I've seen (using a 935), maybe ask on the Garmin forum ? Just had a webchat with Garmin and they don't understand it either. they did say it looked like it was "by design" within Garmin Connect but weren't aware of any changes that prompted it. They've raised a query and I've got to send them a folder later for them to look into it. Seems overkill but I just like to get to the bottom of things. Ps. Just to be clear it's not the overall distance/accuracy I'm querying, as I know that's hit and miss, just the weird rounding up.